According to Michael Tippach and this FAQ, if you don’t know what ASIO4ALL is for, you shouldn’t even bother, because chances are that you don’t need it. But if you really want to know, then the answer you’re looking for is this: ASIO4ALL is a hardware independent low latency ASIO driver for WDM audio devices. And ASIO, which stands for Audio Stream Input/Output, is a sound card driver protocol for digital audio specified by Steinberg Media Technologies. ASIO4ALL should work just fine on any Windows edition you can think of. That’s any 32- or 64-bit version of Windows 10, Windows 8.1, Windows 8, Windows 7, and going all the way back to Windows 2000, Windows ME, and Windows 98SE. Once the installation procedure completes, you’ll notice that a PDF document has been placed on your desktop. It’s an Instruction Manual that nicely goes over all the important things you need to know about ASIO4ALL: how to set up your audio software, basic and advanced configuration, common usage cases optimizations, and more. ASIO4ALL is free software. German programmer Michael Tippach offers this software for the great price of free. ASIO4ALL delivers precisely what it promises. Go get it if you need a free, universal ASIO driver for WDM audio. ASIO4ALL works with any Windows edition you can think of; from the ancient Windows 98SE up to the latest and greatest, which is Windows 10 at the time of writing this. 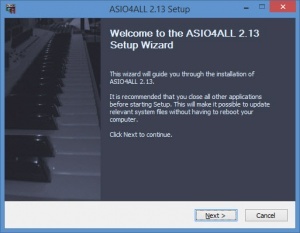 Installing ASIO4ALL on a Windows PC is an effortless process. A detailed manual accompanies ASIO4ALL. German programmer Michael Tippach offers ASIO4ALL for free. You can download ASIO4ALL free here.